Our readers agree that staying at Lime Hill Villa will provide you with the vacation memories that you want to have. With on site tennis, beach access just a short stroll away, and a barbeque area, this villa is an amazing site for your group vacation or your next family reunion. Lime Hill villa is a four bedroom, four bathroom luxury home that was designed for outside living. Open entrances to the living areas, with the west facing openings to the stunning vistas of Freeman’s Bay provide access outdoors. The look of the house is based on the traditional Caribbean great house, it’s upper level clad in greenheart wood, which is also used for all the exterior wood fixtures including balconies, fencing and balustrades, and is all painted in brilliant white. The villa has been built right into the rock beneath the ridge, the rear rim of the resort that culminates in a cliff, and it has a series of rockery style steps winding up the side of the villa beside the driveway to the main entrance. A terrace at the rear of the house, laid with local stone, is cut into the cliff. The living area is done in a modernized great house style, with large sliding doors to both the rear stone terrace and the front of the villa. The room has been furnished with large, comfortable white-upholstered sofas and there are two wicker chaise lounges placed on the terrace by the double sided stairway. The terrace looks onto the pool below, which has a tiled sun terrace with uninterrupted views of the bay. Back inside, on one side of the sitting room is the formal dining area with a mahogany dining table and seating for six guests. Beyond it an open doorway reveals a compact, very well equipped kitchen with Miele dishwasher, refrigerator, freezer and icemaker. The villa has it’s own water filtration device. The tiled infinity pool and terrace faces west and has views of the Bay and English Harbor. There is also a second dining area on the covered terrace to the side of the pool perfect for both lunch and dinner. The rear patio doors open onto the walled stonework terrace. The master bedroom is on the same floor, with super king bed, large en-suite bathroom with full size bath/shower, double basins and outside tropical shower. A second bedroom with king size double bed and en-suite bathroom with shower is also on this floor. Both bedrooms have their own balconies overlooking gorgeous Freeman’s Bay. 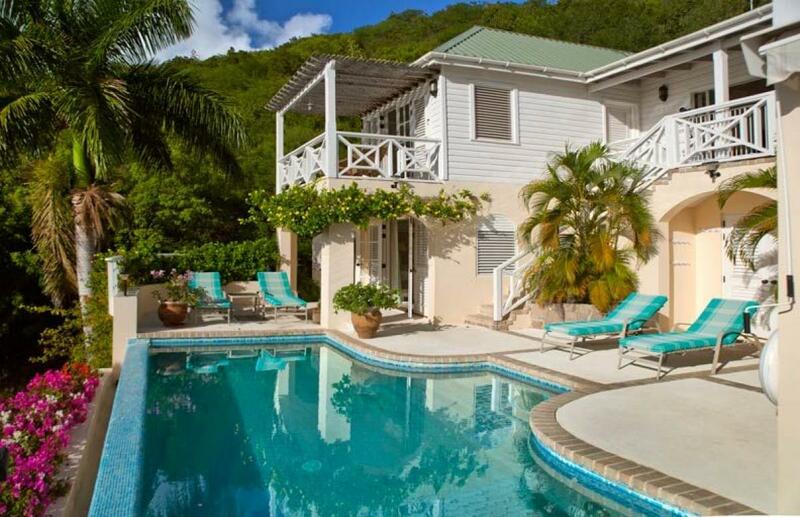 The double Caribbean style over-arch staircase leads down to the pool area, off which are the two other bedrooms, one of which has a dividable super-king bed and en-suite bathroom with shower. Bedroom four, which doubles as a cable TV/video room, has twin beds that can be joined to make a double plus a child cot, and has adjacent bathroom and shower. Both downstairs bedrooms have French doors giving direct access to the pool area, which has dining furniture for up to ten people, and a gas barbecue. The mature garden includes tropical plants such as Bougainvillea, Jacaranda, Paw- Paw, Hibiscus, Alamanda, Christmas Candle, and Oleander. Lime Hill guests enjoy, at no extra cost, all the facilities of the Galleon Beach resort, including reception which has a small library, fax, and Internet access. Phone is available at extra cost, although most mobile phones will work in Antigua.